C. G. Menon is a multiple prize-winning short story writer so it comes as no surprise that her collection feels so accomplished. Not only do the stories range across different countries and counties, they cross into the magical real world of myth and mystery as much as the mundane. From Malaysian vampires – pontianaks – to mermaids and magical mountains filled with trolls, Subjunctive Moods is nonetheless a collection that feels very grounded in the real narratives that we use to shape our identities and journeys through life. In the title story, a young overweight girl is taught the art of food management by her brother’s Russian exchange student. She says of the student that ‘she’s mastered the subjunctive’ and in a way all of these stories seek to unpick those unusual and quiet moments of revelation that turn a life or character in a different direction. There is a sense in which all of these lives rest on the hypothetical: What if Aunty hadn’t stayed to look after a group of orphans (the story ‘Aunty’)? What if life could be transformed into fairy tale (‘Foxgloves’)? What if a mother only stopped tidying away her feelings, managing her past (‘Peacocks’)? What if you could escape the humdrum daily world for life as a mermaid (‘Seascapes’)? I could go on, because for all of these stories there is the possibility that life could be different, that finding a sense of stability in self or place or time, is a difficult shifting task that can flip for the tiniest of reasons. This makes for a very compelling set of stories that exploit the short story’s ability to shine light on those moments in which change is possible. On top of this exploration of mutability is a prose rich in metaphor and simile. C. G. Menon’s style gives a reader pause to explore the multiple layers of point of view in which characters see and interpret based on what they know. A group of people sat in a hotel dining room can be are described as ‘lumpish and cream-fed’ (from the opening story ‘The Ampang Line’) revealing not only their appearance but the reasons for it, as far as the character is concerned. This descriptive detail creates a sumptuous contrast with the quiet nature of the stories themselves that aren’t about dramatic moments of action, but rather those turning points upon which character’s lives hinge and bend in different directions. 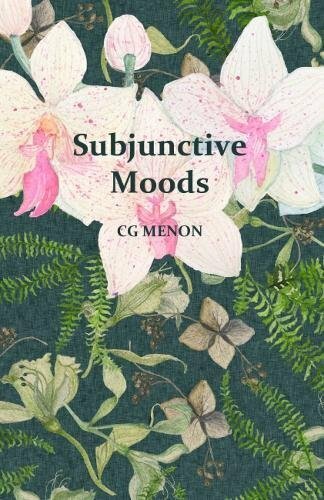 Subjunctive Moods is a wonderful collection that has something for everyone. I should also mention that alongside all of this contemplation there is also a refreshing amount of humour. Human life and its many interpretations are both meaningful and amusing, significant and fleeting. If you would like to win a copy of Subjunctive Moods, you only have to be the first to respond to this post saying you would like a copy. I have two to give away. If you would like to hear Catherine read from her collection, she will be at City Writes, City, University of London, on the 12th July and she’ll be signing copies. You can book tickets for that here. On top of that, I recorded an interview with Catherine for my Authors QH project. I’ll be uploading the interview later today. For those of you expecting a review of Lucia by Alex Pheby, I haven’t quite finished it yet, but will be posting a review of that novel later this week. I also got rather distracting reading Vox by Christina Dalcher and will be reviewing that soon as well. WWould Would love a copy. Thank you! I would love to see a copy too! I’m also interested in the mention to pontianaks, having just read Sharlene Teo’s ‘Ponti’, which centres around a woman who plays one of these vampires in a Singaporean horror movie. Jonathan, you are the second person to get back to me so you win the second copy! I’ll be in touch with you via email for your address. I’m looking forward to reading this, Catherine a very exciting writer. Good review! Sorry you missed winning a copy. I’m glad you like the review though! No problem. Happy to buy a copy! Very intriguing review – would love to have a copyright of these stories! has the other one gone? Would love a copy if not! Oh I’m too late but good review!